Pissouri Residents Association Welcomes You. The Association was formed in May 2006 (first AGM October 2006) with the aim of bringing together all residents of Pissouri (both Ex-Patriot and Cypriot), in order to help each other with exchange of information, co-operation, support and a forum for discussion of matters pertaining to the village. We work in conjunction with the Village Council and Authorities to assist wherever possible in the effective and efficient running of the Village and its affairs. We encourage all residents to register and vote in the Village Elections and provide practical help and information on the registration and voting process. We are a totally apolitical Association, very much focused on the Village of Pissouri and the surrounding environment for the benefit of all residents. We also support and assist with many of the Village activities. We have established and run a Medical Support service unique in Cyprus. We have established a voluntary team of trained first aiders, who will respond to a medical emergency anywhere within the village, to help residents, visitors and tourists when needed. 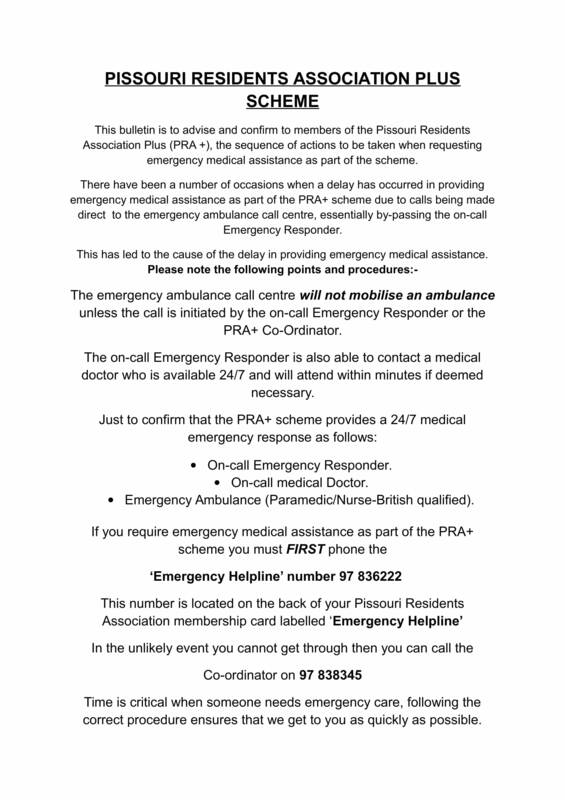 We also have an emergency private ambulance service available to members of the PRA Plus scheme, at very reasonable cost. Acting together we can be a positive force within OUR village!! Ο Σύνδεσμος ιδρύθηκε τον Μάιο του 2006 (η 1η Ετήσια Γενική Συνέλευση έγινε τον Οκτώβριο, 2006), με στόχο να φέρει σε επαφή όλους τους κατοίκους Πισσουρίου (Κύπριους αλλά και άλλων εθνικοτήτων) προκειμένου να βοηθήσει ο ένας τον άλλον με την ανταλλαγή πληροφοριών, τη συνεργασία, την υποστήριξη και τη δημιουργία φόρουμ για τη συζήτηση των θεμάτων που αφορούν το χωριό. Δουλεύουμε σε συνεργασία με το Κοινοτικό Συμβούλιο Πισσουρίου και άλλες Αρχές για να βοηθήσουμε με όσο πιο αποτελεσματικό και αποδοτικό τρόπο για την λειτουργία της Κοινότητας και των θεμάτων που εγείρονται. Ενθαρρύνουμε όλους τους κατοίκους να εγγραφούν και να ψηφίζουν στις τοπικές Κοινοτικές εκλογές και παρέχουμε πρακτική βοήθεια και πληροφορίες σχετικά με τη διαδικασία εγγραφής και ψηφοφορίας. Είμαστε ένας Σύνδεσμος άνευ πολιτικών πεποιθήσεων ή/και σκοπιμοτήτων που καταπιάνεται και επικεντρώνεται με το Πισσούρι και το άμεσο του περιβάλλον προς όφελος όλων των κατοίκων. Επίσης στηρίζουμε και βοηθούμε σε πολλές δραστηριότητες που γίνονται στην Κοινότητα. Έχουμε δημιουργήσει και διαχειριζόμαστε μια ιατρική υπηρεσία υποστήριξης η οποία είναι μοναδική στη Κύπρο. Δημιουργήσαμε μια εθελοντική ομάδα εκπαιδευμένων ‘πρώτων βοηθών’, οι οποίοι ανταποκρίνονται σε επείγουσα ιατρική κατάσταση οπουδήποτε στην Κοινότητα μας για να βοηθήσει τους κατοίκους, τους επισκέπτες και τους τουρίστες, όταν χρειάζεται. Έχουμε επίσης ειδική συνεργασία με ιδιωτική υπηρεσία ασθενοφόρων έκτακτης ανάγκης στη διάθεση των μελών του συνδρομητικού πακέτου ‘PRA Plus’ σε χαμηλό κόστος. Ενεργώντας από κοινού μπορούμε να είμαστε μια θετική δύναμη στο χωριό ΜΑΣ !! Fully guaranteed, registered and legal in Cyprus. Don't risk fly by night contractors. Dr Nitsa Symeou would like to inform you that SYMEOU DENTAL CARE in Paphos has expanded with Drs Marina and Georgina. We are a patient focused practice and always take good care of our clients. This practice has been long-established, we are a friendly team aiming to provide the best dental care possible in relaxed surroundings. We meet the demands of modern dentistry and the practice is well equipped with modern diagnostic equipment – digital radiography, intra oral camera and modern root canal systems. We provide advanced cosmetic dental treatments such as minimal invasive aesthetics, veneers, bridges, crowns, implants and tooth whitening, general dental treatments - fillings, dentures, scale and polish. We always use high quality dental materials. Facial aesthetic treatments, Botox and dermal fillers are performed by Dr Nitsa Symeou who has trained in the UK and Germany. We as a team are dedicated to provide our patients with dental service of excellence. PISSOURI RESIDENTS WILL RECEIVE A 10% DISCOUNT ON ALL OF THE ABOVEMENTIONED TREATMENTS ON PRODUCTION OF THEIR PRA MEMBERSHIP CARD. Mark Bayliss Painter and Decorator. Registered and legal in Cyprus. An aerial view of our village. The Pissouri Residents’ Association has in operation a First Response team, complete with a well equipped vehicle, who will respond to any medical emergency in the village of Pissouri. The team will provide immediate first aid at the scene and advise on whether a local Doctor, or an ambulance should be called for. This help is available to all and is not dependant on being a member of the Association, membership of which brings additional benefits. At the present time, all the Responders are English speaking residents. WHAT CAN THE PRA DO FOR YOU?? Perfect opportunities to meet new friends, and obtain useful information. Reasonable prices in our exclusive clubhouse just off Pissouri square. Ambulance facilities free of charge if you have a medical emergency. On Holiday?? You can call in at the 1911 Clubhouse and join as a temporary member. This will enable you to enjoy our reasonably priced bar and our social events whilst you are here. All our memberships are a great bargain. Contact us for further information. The contents of this website are Copyright Pissouri Residents Association 2018.